Lindsay whirled on Clint suddenly, and pushed her face close to his. He flinched, but didn’t withdraw. She breathed in his scent for a moment, savoring it along with the fact that she had an ace to play at last. “Do you want to go to Seattle?” she quietly inquired. He shook his head and ran a hand through his hair. “You know, the road trip sounds great, and I really, really want to find her. But I’ve still got to see whether I can’t salvage something with Graphitti.” He pulled his phone from his pocket and dialed a number. Before he hit the send button, he looked back at her. Lindsay could totally believe he hadn’t thought of it. “Right,” she said, and started again for the valet station. Clint pulled out his phone and tagged along behind her while waiting on hold, his eyes intense. He was so engrossed in his call that he strayed dangerously toward the curb. Lindsay turned just in time to see him stumble off the sidewalk and into the street. Of course he didn’t see the motorcycle. “Clint! Wait!” She leapt for him, grabbing his shoulder just in time to rip him out of harm’s way. What happened next caught her utterly by surprise. Even before he stumbled back into her and knocked her to the ground, fire raced through her fingertips to fill her entire frame. Her body tensed and her breathing went shallow and rapid. Her eyes dilated, and the whole world seemed to glow before her in a vague, minimalistic way. A Clint-shaped blob clambered to his feet and jumped back. A distant, metallic voice wailed, “Why’d you have to go and do that?” She wasn’t certain she’d heard the words correctly, but she could tell it was him, and the sound was sugar to her ears. Her mind’s eye filled with the vision of Clint’s face, and an overwhelming urge to possess him wrapped itself around her heart and mind like a boa constrictor. A sensation welled inside her, a lioness rising and stretching her legs before a day of hunting; and the only thing it saw was him. More than anything in the world, she desired him body and soul. She rose to her feet knowing beyond doubt that she must seize him now or lose him forever. After all these years, had she really been suppressing this much emotion with regards to him? The feelings of lust were frighteningly unnatural; she wondered if this was what it was like to be male. No! her inner voice screamed. Lindsay, get a grip! But there was no shaking his face, or the burning desire to lose herself in him. He ripped your heart out and let it bleed on the floor, Lindsay! Let him go! You don’t need this case! You don’t need him! The voice in her head made some annoyingly notable points. Clint had been a sham in high school. Was he likely any different now? She shook her head. Stop it, Lindsay. You sound like a middle-school girl. Clint was now striding—no, jogging—away from her. The only logical course was to follow him, and tackle him if necessary. He must not be allowed to get away! Then she refocused her mind. The case. That was what was important. There was no way she’d give in to Mom and Dad’s expectations that she would utterly fail without them. Clint was just another guy like any other. The real Lindsay was more than some freak storm of hormones. The real Lindsay Sullivan needed no man. Let him run. See if she cared. Just get the car and get this over with, she told herself. With an abrupt about face, Lindsay Sullivan tore herself away from the absolute need to have Clint Christopherson. Clint's life post-wish is worthy of a cable TV series. I love the opening scene between him and his latest accident, Jane. I'd say he got what he deserved, but frankly I wouldn't wish Jane on an enemy. On the run from crazy Jane, Clint seeks the help of a private investigator to help him find the gypsy responsible for granting his ill thought wish. 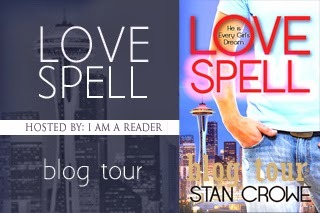 Enter Lindsay, who has had feelings for Clint since high school, until he inadvertently broke her heart. Lindsay is trying to pull away from the mold her wealthy parents want fit her into. When Clint walks through her door, she's just desperate enough to swallow past feelings and take his case. Looking for adventure, I think Lindsay found a bit more excitement than she was looking for. I loved the characters in this novel. Even though I frequently wanted to bash Clint upside the head, it's really hard not to like him. The dialogue between the characters is witty and real. Things got a bit weird toward the end once the gypsy was involved, but I still enjoyed it. This is a great book to read when you're down or stressed and looking for something fun to cheer you up. 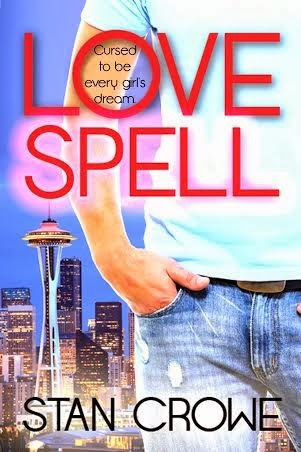 Add Love Spell to your TBR list and pick it up when you need an entertaining story that gives you a good laugh. Stan had a pretty normal, middle-class American youth. He was lucky enough to change that by convincing an exceptional woman to marry him in 2000, setting him on a much more fulfilling life course. Four years later, Brigham Young University awarded him with a Bachelors of Science in civil and environmental engineering. He then he spent several years designing homes, prescribing work for bridges, and even exploring the mortgage industry. In the midst of all this, he produced two science fiction anthologies in 2006 and 2007. In 2012, Breezy Reads Publishing picked up his romantic comedy The Cinderella Project. And thus he transformed himself from Captain Kirk into Don Juan. Stan lives with his wife, children (final count to be determined) and two cats in Utah.